Asphalt is an amazingly creative substance with a long history of diverse use. It has been used in countless ways for centuries by many different cultures around the world. Records show that the first use of asphalt was probably by the inhabitants of the Euphrates river valley in southeastern Mesopotamia, which is now Iraq. In early years Iraq was called Sumer or Accad, and later, Babylonia. Many natural deposits of asphalt were found in this region between the Nile river in Egypt and the Indus river in India. An ancient legend tells that, as a baby, King Sargon of Accad was placed in a reed basket coated with asphalt by his mother, Itti-Bel, and set adrift on the waters of the Euphrates river around 3800 B.C. This legend corresponds closely with the story of Moses being set adrift in the Nile river in an asphalt-coated basket. The early uses of asphalt include cementing bricks together for the construction of buildings and pavements and for protecting exterior masonry surfaces. It was also used for trowling the surface of interior floors and stair treads, and for waterproofing baths and drains. Excavations at Teli-Asmar, 50 miles northeast of Baghdad, on the eastern bank of the Diyala river, reveal that the Sumerians used asphalt for building construction between 3200 and 2900 B.C. Mortar composed of asphalt mastic was also found in excavations at Ur, Uruk and Tello in the vicinity of the Euphrates and Tigris rivers. In the same region, at Khalaje, excavations have uncovered floors composed of layers of asphalt mastic 3-to-6 inches thick, as well as clay bricks bonded with asphalt. Historians believe that Noah used asphalt in the construction of the ark. The Biblical text reads that the ark was treated with “pitch” (a bituminous substance) inside and out. Canoes and dugouts in the early days were also made watertight with pitch. There are numerous other references in Christian scripture to what we now know was asphalt. The use of bulrushes and pitch was an early method of building boats. As late as the 1960s, boats known as “guffas” were built of woven reeds caulked with asphalt and were used to ferry passengers and cargo across the Tigris river at Baghdad. The Babylonians were exceptional builders. The Babylonian kings built roadways, retaining walls to keep out the Euphrates river flood waters, battlements and grand palaces. 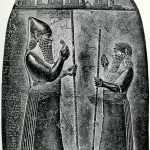 Babylonian King Khammurabi had a building code in 2200 B.C. that showed the comparative costs of coating houses and boats with bituminous mastic. Excavations in Babylonia have uncovered bricks bonded with asphalt that have remained in place for thousands of years. These excavations also uncovered a large stone tablet describing King Nebuchadnezzar’s building activities. The tablet reveals that Nebuchadnezzar’s father, Nabopolasser, built a retaining wall of dried clay bricks to hold back the Euphrates river from flooding his palace. King Nebuchadnezzar never stopped building and in many of his works he used asphalt. He built a 370-foot bridge across the Euphrates river near Babylon. The piers were constructed of burnt bricks embedded in asphalt mastic, and the base of each pier was coated with asphalt. Nebuchadnezzar also built large sewers made of asphalt, loam (soil and clay mixture) and gravel to drain the city of Babylon. On his third voyage to America in July 1498, Christopher Columbus welcomed the restorative powers of asphalt for his storm-racked ships. On that voyage, he discovered the Island of Trinidad and the lake of asphalt called Lake Trinidad. It has been said that he moored his ships and caulked their storm-racked seams with asphalt from Lake Trinidad. Not only as medicine and as storm-proofing for ships, asphalt also had early uses as pavements for roads. Historians have established that around 1500 A.D. the Incas of Peru constructed an elaborate system of highways, some of which were paved with a composition similar to modern bituminous macadam. Davis is a contributing editor to Asphalt magazine. Information for this article was taken from “Asphalts and Allied Substances, Volume One–Historical Review and Natural Raw Materials” by Herbert Abraham.